The PANEL15 is specifically designed as front end interface for rugged, secure sensitive environments, where reliability and quality are key issues. The PANEL15 expands MPLs Panel-PC Family of compact, easy-to-integrate and multi-functional All-in-One solutions. The product is specifically designed and built for none standard environments. It combines a 15" display with excellent optical specifications, an optional touch screen, and a complete range of low power embedded CPU boards. 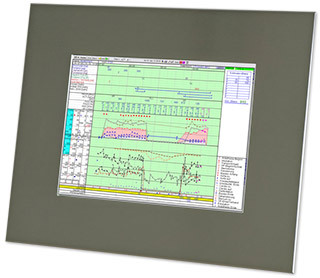 The front of the Panel15 is IP65 protected with a stainless steel frame. On the back side, various PC interfaces are available for the user. Like all other MPL products the PANEL15 requires no fan regardless if a single-core Atom or a quad-core i7 is installed. The solution is easy customizable and expandable for basically all customer needs and requirements. The robust and IP65 protected PANEL15 is the perfect solution as man machine/front end interface for harsh applications like in transportation, maritime or for clean environments like in medicine, food industry. Further as space saving, fanless and noiseless system the PANEL15 is the ideal solution for cabinet applications in telecommunication, kiosk information systems and Internet access points. Use of our reliable, long-term available Embedded Computer Boards out of the PIP Family. The below given values are from our used standard 15" LCD. Controller Interface USB, touch and mouse simultaneously possible!